Scrolling through documents, web pages, and other data with a trackpad or mouse is one of the most common computing tasks and used gestures. 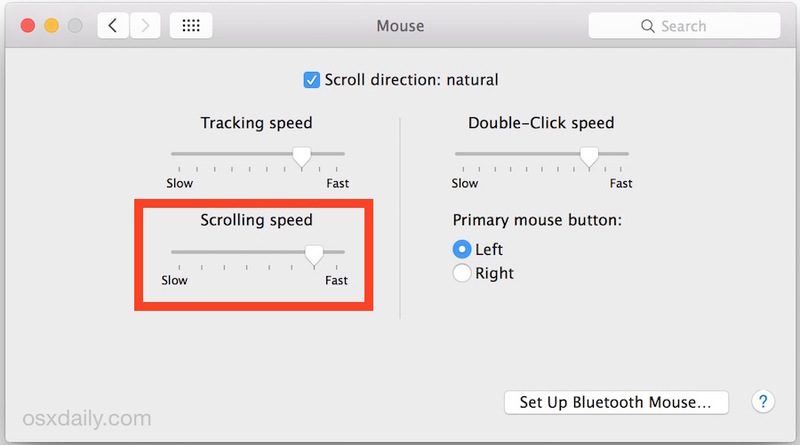 By default, the scrolling speed on a Mac is not particularly speedy, but with some settings changes you can customize the scrolling rate in Mac OS X for both a Mac trackpad and a two-finger scroll, or a mouse connected to a Mac with a scroll wheel. The pace settings are actually separate, meaning you can have a different scroll speed set for a connected mouse and a different scrolling speed set for something like a built-in MacBook Pro trackpad. Changing the Trackpad scroll speed, meanwhile, is in another settings area. For Mac laptops and the Magic Trackpad, changing the speed of a two-finger scroll is done through the Accessibility settings, not in the Trackpad settings. For both the trackpad and mouse, any changes to scrolling speed are immediately noticeable, so it’s a good idea to have a webpage or document open to test scrolling in. This process is the same on all modern versions of Mac OS X and with all Mac hardware, including MacBook Pro, MacBook Air, MacBook, Magic Mouse, Magic Trackpad, and third party trackpads and mice as well – for both USB and Bluetooth connections. Separately, you can use a third party application to control the acceleration speed of scrolling with a trackpad or mouse on a Mac too, though most users will find that unnecessary. I’m on an iMac 27, 2009 on OS X Yosemite, 10.10.3. I have a magic mouse and a USB mouse — I’m ambidextrous. When I go to System Preferences, Mouse, I get a Point & Click that only has a slider for tracking. It’s other menu is for More Gestures. Where’s the scrolling slider? Accessibility pane, same as illustrated in the article for the trackpad. It would be nice if Apple chose to use a woman’s hand in the little video’s showing the trackpad. Preferably someone with nice long blood red manicured nails. Your illustration of the System Preferences is not up to date. For Yosemite, you have to go to Accessibility to change the scrolling speed. How to change the magic mouse speed on login screen? 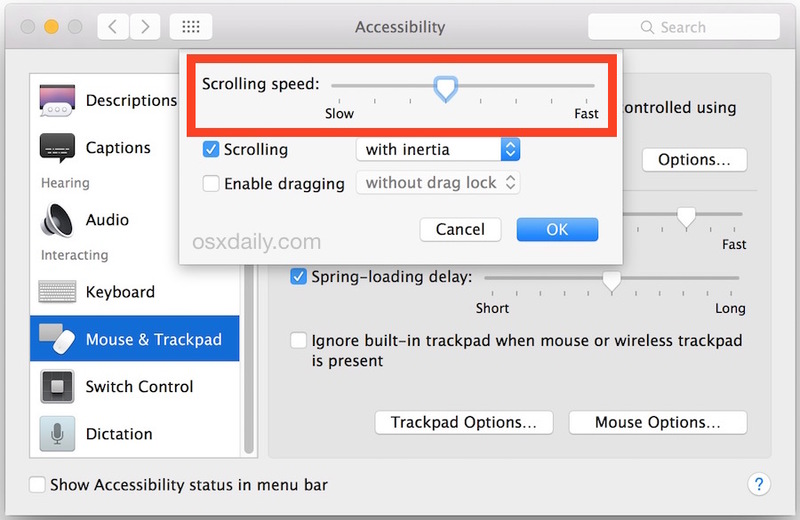 While in Accessibility > Trackpad Options, check the Enable Dragging Without Drag Lock. I find that option very handy and use it all the time. The Enable Dragging should be in System Preferences > Trackpad. Phiw13, trackpad and magic mouse have only one slide and it for acceleration as Carl Bergman pointed out. My scrolling speed is fine, except some webpages e.g. my webmail app have different sections and the speed is really fast in one of the sections and normal in all the rest. Why is that? I have recently bought a USB mouse for my Mac book pro el capitan version. There is an option for the trackpad called enable dragging with drag lock that makes things easier to read for me as I need to select one word and simply slide across each word without having to hold the trackpad button. Could you please tell me if there is there any way I can replicate this for this the USB mouse? So obvious. So simple. So helpful. Thanks.